What’s up, Nomsters! While eating my way through Seattle, I stopped in at Xiao Chi Jie in Bellevue for some awesome Chinese street food and I was genuinely impressed! They mentioned that, as of writing this, Chinese street food places serving the dumplings and dishes they offer are super few and far between, so they wanted to bring these amazing dishes to the states. The menu is small, and that’s really what I like to see. Some places try to do too much, but Xiao Chi Jie specializes in just a few things and does them really well. Let’s take a look! The Sheng Jian Bao from Xiao Chi Jie was the standout dish for us. If you’ve never had one of these before, they’re similar to Shanghai soup dumplings, but in our opinion, sooo much better. First off, they’re huge. It’s probably best to eat one of these in two or three bites, but given the soupy filling, I did manage to get a whole one in my mouth to try to keep it from spilling out. The outside was lightly seasoned and had some black sesame and green onions, but the majority of the flavor came from what’s inside. 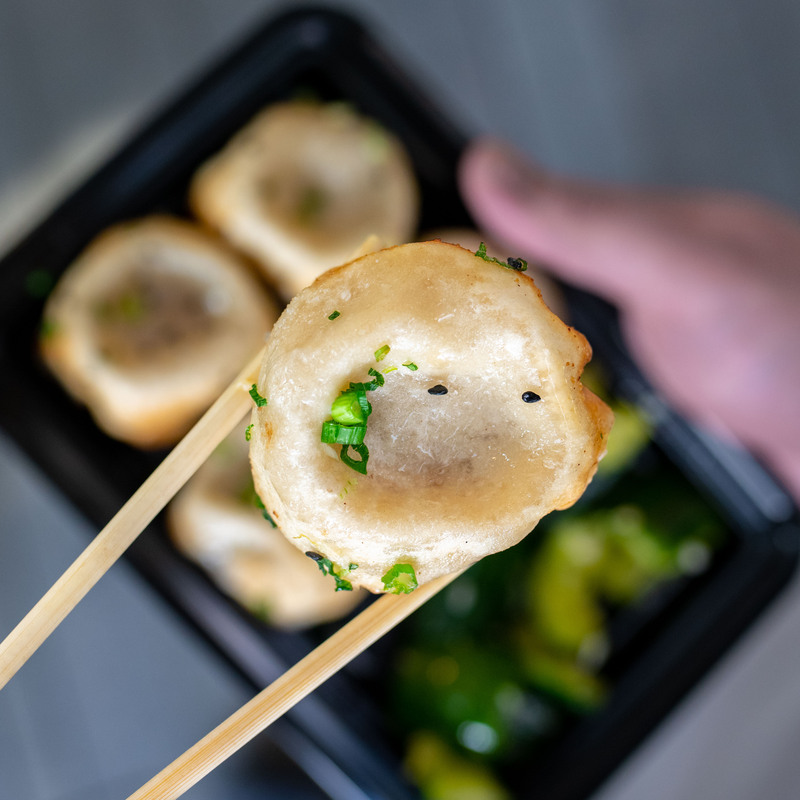 A difference between the Sheng Jian Bao and a Shanghai soup dumpling is that these are pan fried, so they’re lightly crispy on the outside, and the dough is a bit thicker. The pork and soup filling was so flavorful, and I definitely recommend it! The Jian Bing is a bit more common in the states, and is a traditional Chinese street food often eaten for breakfast. 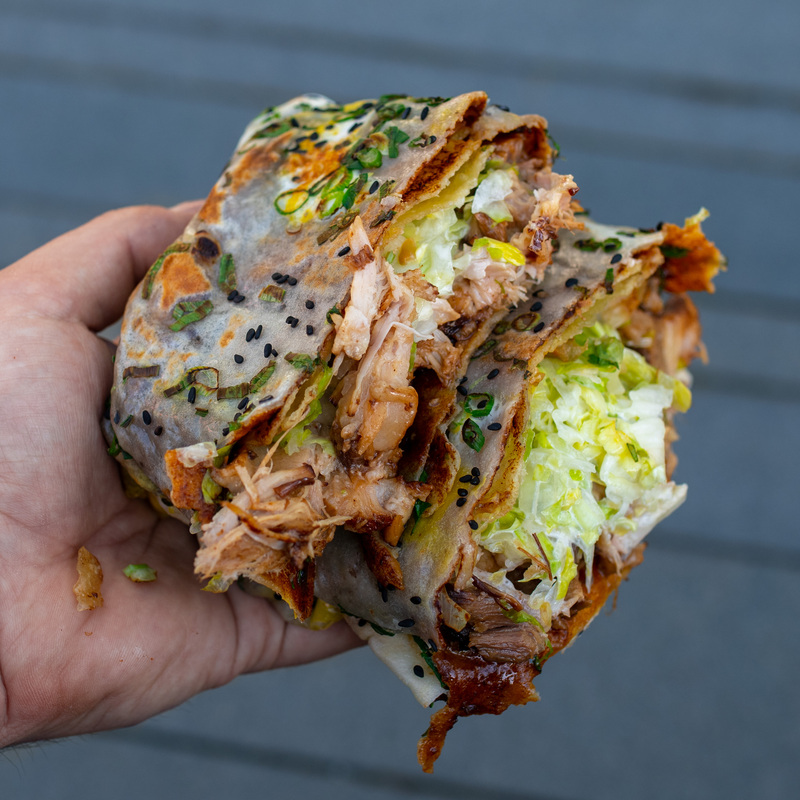 It’s similar in some ways to a crepe, but Xiao Chi Jie makes theirs with egg, crispy wontons, cilantro, pickled radish, lettuce, sesame seeds, green onion, and their super secret sauce. I don’t have any clue what their super secret sauce is made of, but I do know that it’s SO tasty and compliments everything else perfectly. If you want it the traditional way, you’d just have it with the crispy wontons in the middle, but I definitely recommend throwing some pork belly in there. Their meat was moist, full of flavor, and they’re super generous with their servings! I can almost guarantee you’ll be full after eating this. It’s big. 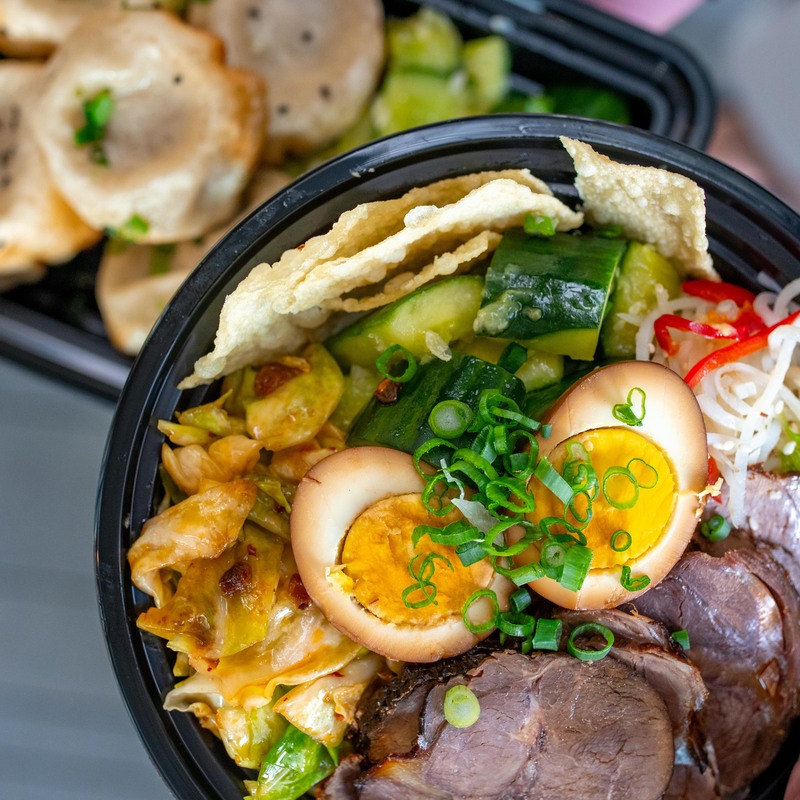 The Rice Bowl was the least impressive of the three dishes, but the fact that it’s the most familiar might be contributing to that feeling to a certain extent. It’s a great balance of textures from the crunch of the crispy wontons and the cucumber to the softness of the eggs, meat, and rice. I wasn’t as big a fan of the beef in this one, so if I was doing it again, I would definitely get the pork belly instead. It was seriously bomb. Overall, I was truly happy I got to try out Xiao Chi Jie and I’ll definitely be back the next time I’m up in Seattle. I really hope the Sheng Jian Bao catches on and becomes more readily available in the Bay Area (maybe open a spot down here? :D) because those were unbelievably tasty. Hit them up when you get the chance and let us know what you think! Till next time, Nomsters! Or check out our SF Bay Area, Washington DC, Maryland, or Virginia tabs!